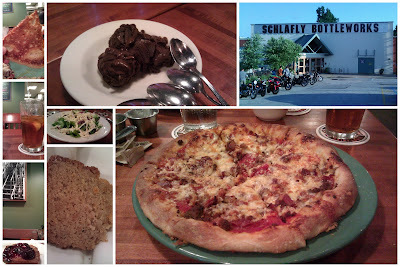 The Pizza Files: Schlafly Bottleworks July 2011. Binge 2011 Stop 10. Schlafly Bottleworks July 2011. Binge 2011 Stop 10. 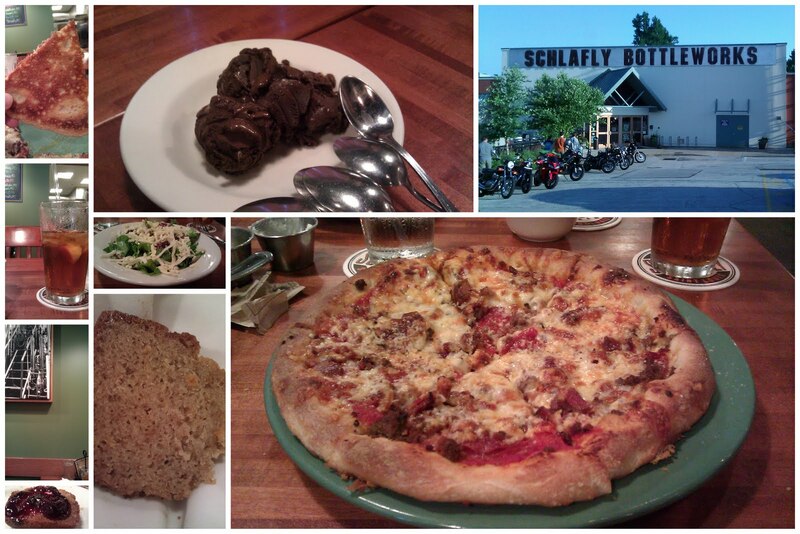 For stop 10 of the Binge I found myself and a car load of non-pizza eaters at Schlafly Bottleworks in Maplewood, MO. We started with a couple of appetizers, the Spent Grain Beer Bread and The Farmer's Platter. Both were great, but the Beer Bread was excellent. I could have made a meal just out of it. The Non-Pizza eaters got... well not pizza. I ordered the Carnivore. It had Bison, pepperoni, bacon, salsiccia, red sauce and the house blend cheese (mozzarella, smoked gouda, provolone, jack and chedder). As with my previous visit it was excellent.